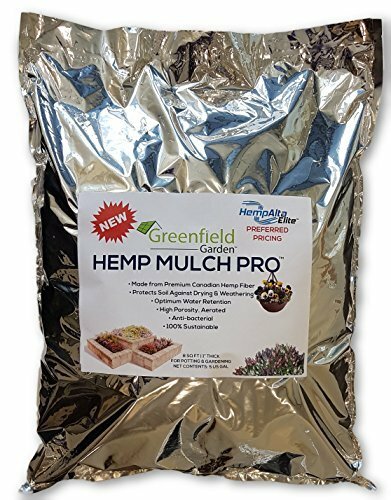 Hemp Mulch Pro is specially processed, 100% premium organic Canadian hemp mulch for indoor plants, garden potted plants and hanging baskets. This lightweight plant mulch will provide your plants with the proper care they deserve while giving them a clean decorative finish. Keep your plants from drying out. Hemp Mulch Pro's scientifically-determined refined size allows for high performance protection against drying and weathering, so you keep your plants protected from the sun's heat and dry climates all year long. Don't waste more time watering your plants, Hemp Mulch Pro provides your plants with optimal water absorption and retention capacity; retaining up to 4x its weight in water, so you can reduce the frequency of watering. Non toxic and naturally antibacterial, Hemp Mulch Pro is resistant to mold and decay. Hemp Mulch Pro is nevertheless fully biodegradable and can be composted. Hemp Mulch Pro provides the perfect natural plant finish that spruces up any room decor! Covering any soil & potting mix surface, Hemp Mulch Pro gives plants a chic clean finish and doesn't contain any added dyes, so you know it's 100% natural. Keep your plants hydrated and transform them from shabby to chic! Add Hemp Mulch Pro to your cart now! *Occasional viable seeds may occur in product. If sprouting occurs- sprouts should be removed. Manufacturer: Canadian Greenfield Technologies Corp. Publisher: Canadian Greenfield Technologies Corp. Studio: Canadian Greenfield Technologies Corp. If you have any questions about this product by Greenfield Garden, contact us by completing and submitting the form below. If you are looking for a specif part number, please include it with your message.